This long length solid copper ground bar with high conductivity is the primary choice for grounding towers and antennas. 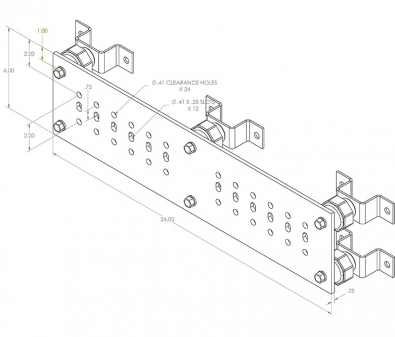 Offers 24 equally spaced holes and 12 slotted holes for numerous and various grounding accessories. This ground bar’s high ampacity allows for multiple ground connections from the electrical system. The kit includes robust stainless steel mounting brackets, bolts, and washers for a strong long-lasting foundation for grounding. The standoff insulators are made from fiberglass-reinforced thermo-set polyester with higher moisture, heat tolerance, and mechanical strength to enable electrical installers to crank up closer height tolerances, making more suitable for ground bar and perimeter grounding applications. Recommended for large sized tower networks. It is highly recommended to tin plate the ground bar outdoor or other harsh environments, as tin electro-plating reduces the chance of corrosion interfering with the ground contact connection. Tin plating also disguises the copper color, serving as a secondary theft deterrent, while making the copper unusable for illegal recycling. Consider how many connections need to be grounded; longer lengths have more holes for more connections and higher ampacity ratings.